Under the Volcano is a 1984 film directed by John Huston, written by Guy Gallo, and starring Albert Finney, Jacqueline Bisset, Anthony Andrews, and Katy Jurado. The film received Academy Award nominations for Best Actor in a Leading Role (Albert Finney) and Best Original Score (Alex North). It is based on the semi-autobiographical 1947 novel by English writer Malcolm Lowry. The film tells the story of Geoffrey Firmin, an alcoholic British former consul in the small Mexican town of Quauhnahuac on the Day of the Dead in 1938. The film was entered into the 1984 Cannes Film Festival. Reviewing in The New York Times, Janet Maslin had much praise for Finney's performance. The film was enthusiastically received. Huston's drama has sometimes been shown in tandem with an earlier documentary film: Volcano: An Inquiry Into the Life and Death of Malcolm Lowry (1976) is a National Film Board of Canada feature-length documentary produced by Donald Brittain and Robert A. Duncan and directed by Brittain and John Kramer. It opens with the inquest into Lowry's "death by misadventure," and then moves back in time to trace the writer's life. Selections from Lowry's novel are read by Richard Burton amid images shot in Mexico, the United States, Canada and England. There are two documentaries about the making of the Huston film: Gary Conklin's 56-minute Notes from Under the Volcano and the 82-minute Observations Under the Volcano, directed by Christian Blackwood. ^ "Festival de Cannes: Under the Volcano". festival-cannes.com. Retrieved 2009-06-23. ^ Maslin, Janet (13 June 1984). 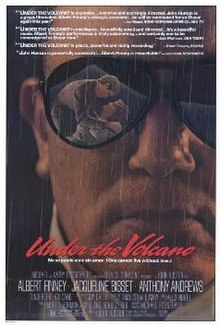 "Film: Huston's 'Under the Volcano'". The New York Times.